Conclusion turkeys try to coincide with the end of may. On the street just a warm weather, a garden planted and have time to Tinker with Chicks. Though Turkey hen a diligent and caring mother, always careful, how are the turkeys. Sometimes heavy and awkward may trample the baby. After the withdrawal of all turkeys can be safely allowed to the Turkey. Feed the birds begin no later than 10 hours after birth. Roll out on the floor first, Newspapers, then the burlap in two layers. First, turkeys are not part of the legs, and secondly, they have a sweet beaks, and if they knock them against something solid, then get sick. Pour the feed and knock on the floor with your fingers so that they began to bite. Water (slightly pink from potassium permanganate) place in flat bowl - saucer with an inverted center a half-gallon jar. You can give and strong brewed (spits) tea. The first day usually feed rubbed through a sieve cooked hard-boiled egg and fresh low-fat cottage cheese. On the third day of life, add to them the finely chopped nettles, green garlic or onion and grated carrot. To feed the green onions and garlic to the Turkey Chicks the day. If you feed in the evening, it will cause extremely thirsty and youngsters out for the night to sleep. 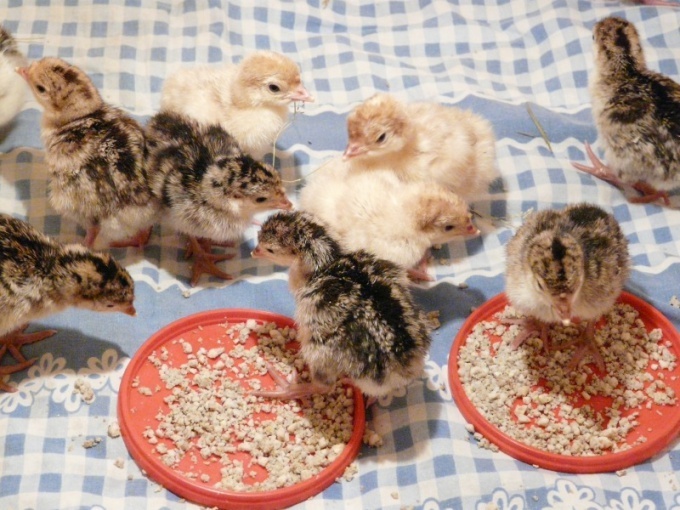 A week after the conclusion start to give the turkeys cooked millet. First with egg, then without it. Age at switch to mash on the basis of sour milk (or beef broth), mixed with crushed wheat, oats, wheat bran. Well eaten and greens (cabbage leaves, beet stems, garlic, nettle, alfalfa, clover, plantain, chickweed; especially useful herb with a bitter taste: yarrow, dandelion, sow Thistle), finely chopped and mixed with yogurt, feed and the addition of 10-12 drops of fish oil on the chick. Fish oil is good to alternate with vitamins trivit and tetravit (100 ml dilute in 1 liter of vegetable oil and add 1 teaspoon to the feed of Turkey poults 12-15). Two weeks let's vitamins, then at the same time take a break and let only food and herbs. And for strengthening of bones backfilling of fodder dried and ground up the shells from the eggs or bone meal. For the regulation of the digestive system be sure to place them in a bowl of sand. Vyvezshim Chicks need to ensure a dry and warm place. So the first two weeks do not let the turkeys in the paddock (bring in a box and under glass). Up to three months to literally protect them from the rain. If it happens that the bird gets wet, take it to the house, dip feet in vodka, push to the throat 1-3 (depending on age), pea black pepper and warm on the stove. Weakened turkeys let's say glucose and dissolved in water.